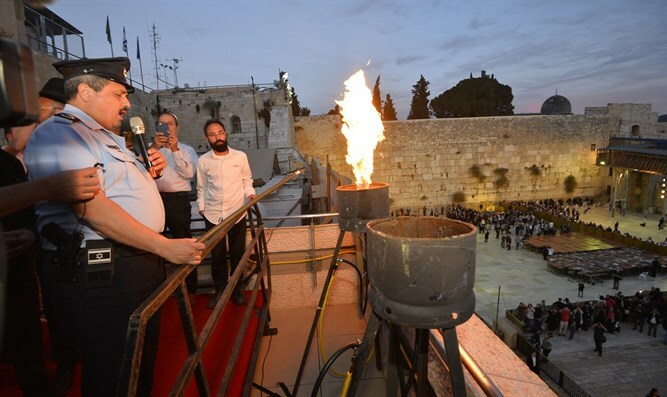 The lighting of the first Hanukkah candle at the Western Wall took place Tuesday evening in the presence of the rabbi of the Western Wall and the holy places, Rabbi Shmuel Rabinowitz and Commissioner Roni Alshich. The ceremony was attended by the Director General of the Ministry of Religious Services, Oded Plus, the IDF Chief Rabbi Rami Brachiyahu, the Jerusalem Police District Commander, Yoram Halevy, commanders of the David Region, and dozens of police officers. The rabbi of the Western Wall mentioned the passing of Rabbi Aharon Leib Steinman zt"l, and expressed his prayer that the great light that ascended to heaven today will bring a great light on Zion with the building of our Holy Temple. "The victory of the Hasmoneans (Maccabees) is a victory of the spirit of the people of Israel, forever. The people of Israel, with the help of this spirit, struggles with and defeats all those who try to harm them. We offer thanks today for the miracles of those days at this time. We are also thankful to the police Commissioner and all the policemen who contend and give of their lives every day for the citizens of Israel in general and the visitors to the Western Wall in particular. That God will guard the comings and goings of the Israel Police officers from now to eternity." The commissioner said, "'A little bit of light dispels much darkness.' It was not for nothing that the people of Israel chose to commemorate Hanukkah through light. Light is like love, devotion, and service that can be passed on to others, and that is what every Israeli police officer does. We security forces fight again and again against darkness." The police Commissioner added, "We pronounce a blessing over lighting one Hanukkah candle, even though many candles are lit. The lighting of the Hanukkah candle creates and symbolizes the unity of the Jewish people. One nation with one heart." During Hanukkah, a special event takes place every evening at the Kotel for lighting Hanukkah candles with participation of various personalities.